The thing about straight keys is that they are very seldom, if ever, "off" (either out-of-adjustment or subject to an inappropriate state-of-the-op). Thus, bottom-line, the most reliable of keys. I circulate among five straight keys (J37, Junker, Kent, SKCC and GHD) two single-levers that are good sideswipers and a hacksaw-blade type cootie. When I reentered ham radio a few years ago after half-a-century away, I adopted the Euro arm-off-the-table style of straight key work. I think it's easier, less tiring that way. Yes at 20 WPM and higher one can get a bit tired during a long ragchew. Then it's time for a 73 or glass of ale hand-brewed. I have 6 CW keys here...A bug, 3 keyers, a Brass Racer Iambic, and a Nye-Viking straight key. I use the straight key the most due to involvement in SKCC activities. And that's after 27 years. So, I am curious how many other old timers still suffer along with a hand key for CW contacts? Me for one, since 1960. I don't get the "still suffer" comment. I still use my original Novice J-38. I really respect folks who use bugs, and of course a cootie counts as well. Anything where one's fist can be recognized. There are lots of members in the Straight Key Century Club, check it out. Iambic pentameter is for poets. Keyboards are for ... well, it lets many folks take advantage of the S/N benefits of CW, but I think it makes it just another digital mode. Folks who use keyers and who can communicate by ear at high speeds are amazing. It might as well be understanding Italian spoken backwards, and I took Italian, French and Spanish in school(s). My last CW contact was a limit switch held in the left hand between 1st 2 fingers and thumb, keying with the right index finger. Priceless. I still use a Navy Flameproof, the kind of key I learned on for Uncle Sam. And I too miss the days that you could recognize the operator by his hand. I too have a collection of keys including my original novice key. As much as I like the romance of a hand key I guess I'm the exception to the rule, I hate using the things. Even when I was a kid one of the first projects I built was a single lever paddle and relay keyer, and I never looked back. I guess I'm just not wired for it, I find hand sending a chore. I even have a K1EL keyer in the car. HF mobile CW is a blast, I can't even fathom doing that with a hand key. So to answer the OP's question, not this (semi) old timer. I've been in the hobby since 1965. Started on a straight key and moved on to a bug then a single lever keyer paddle and finally to an iambic paddle. I rarely use the straight key (works great for xmitter tune up). Lately I've been using an old Les Logan bug, but I can go to the iambic paddle for contests. 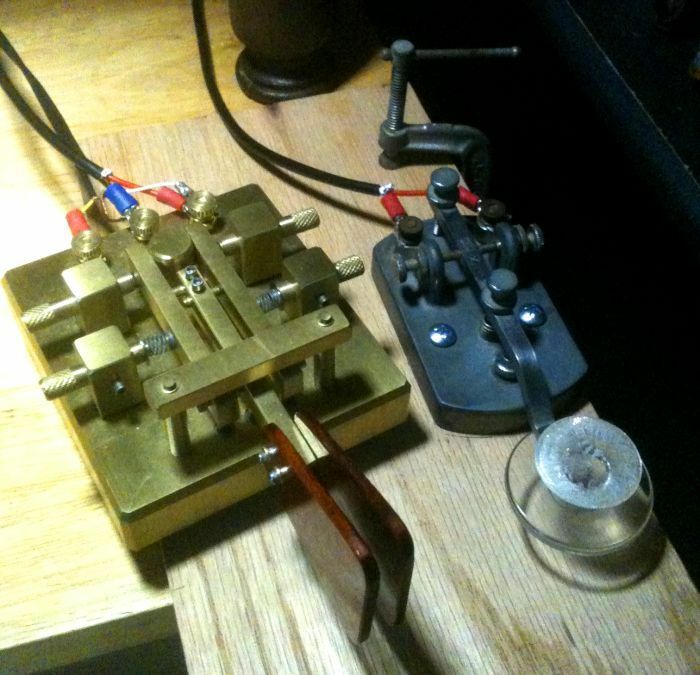 Although I use a Vibroplex Iambic and a Te-Ne-Ke for SOTA operation, most of my operating is with one of the roughly two dozen straight keys, cootie keys, and bugs in my collection. The J-37 (J-44 config) that I learned to send with in the late '50s is still in the rotation, but the key that's always at my right hand is the SKCC's NT9K Pro Pump. At my left hand, I always have a GHD straight key and a cootie-wired Vibrokeyer. I've owned a Bencher model# BY-1 iambic paddle since 1981, but I've never mastered it. I'm still most comfortable straight keying at about 16 wpm with my WWII U.S. Navy key. I began with a straight key and bug when in the Air Force in the late 1950's. Went to a paddle and bug years later when I became a radio amateur. However, now exclusively on a straight key and have a half-dozen. Going all-QRP and slowing sending speed down contributed to that method. Also, my old HW-8 and Argonaut 509 require a straight key and even though my K1 has a keyer, I still stick with one of the straight keys. I find sending difficult above 15wpm on my straight key. Begali Simplex on my right hand. Palm Mini on the left. Really enjoy CW when I get into a nice rhythm and everything seems to click! i use a Bencher straight key (RJ-1). I use the keyer with the K8RA paddle most of the time - but for SKCC, SKN, etc., or when I need to send less than 20 WPM I use the "Speed-X" with the navy knob - can't send much faster than 12-13 WPM with it though. I still have an old Navy flameproof I use on SKN and sometimes just for fun, especially if replying to a slow sender. But I mostly use my Bencher paddles, when I am not using a microphone or other digital mode. Though I`ve used bugs and iambic keys at field day and club events,I still prefer my old Nye Viking Master Key. It`s tough at faster speeds,but other than that I love it. I see I`m not alone!